Our aim is to promote all aspects of astronomy to all ages, beginners and experienced, and to provide a suitable location where all those interested can meet and share knowledge and experience. We meet on the second and fourth Mondays of each month at 7.30 p.m. at the Village Hall in Tottenhill. Talks / events and observations are scheduled for meetings (please see our EVENTS for more information). However, this schedule may be varied in order to take advantage of good viewing conditions. 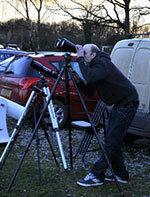 If weather conditions are favourable we also meet on the other Mondays for an evening devoted to observation. These sessions are ideal for all levels of experience and members and non-members can gain a practical view of the night sky. No equipment is necessary as various pieces of equipment will be available for non-members to use. "Do you need some help with astronomy in your school, scout group or society? To further our aim to promote astronomy we offer outreach talks and practical experiences to all groups in the West Norfolk area. We are happy to visit your location often bringing telescopes to give your pupils, scouts, members the chance to see first hand the wonders of the night sky. Please contact us for more information (See the contact panel at the foot of this page)." Whilst non-members are welcome to all of our meetings, full membership entitles you to a number of benefits including reduced fees to all special events, use of club telescopes and the KLADAS newsletter. Click here to find out more.